rec. Petruskirche, Stockholm, no date given. 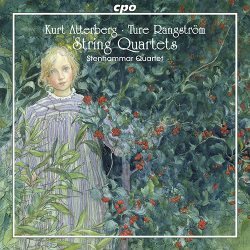 The German label CPO has done sterling service by these two Swedish composers, recording all their symphonies (Atterberg ~ Rangström), and much other orchestral music, in the case of Atterberg. The chamber music of each composer is little known. I can find two other recordings of the 2nd Atterberg quartet, but none of the other two works, though CPO doesn’t claim premiere recordings. I remember relishing each new CPO release of the Atterberg symphonies, and I see that Chandos has now begun their own cycle with Neeme Järvi and the Gothenburg orchestra. Fortunate we are indeed to live in a time when there is a choice of Atterberg symphony recordings. His best known work is the Sixth, which won the 1926 Columbia symphony competition. His orchestral works are drenched in memorable melodies. The Rangström set are not quite so rich, but still interesting. It was on the basis of the symphonies that I looked forward to this recording when its release was announced. Sadly, I find myself disappointed. First, a point of explanation regarding the unusual details for Atterberg’s Quartet No. 3. His first string quartet was incomplete with only two movements, but still published as op. 2. Those two movements were then incorporated into a complete work – No. 3. So to the music. Expecting cascades of melodies, I found few, particularly in the Atterbergs. Much activity to so little effect is my regrettable conclusion about both works, as I found myself unable to maintain attention. The fast movements involve lots of rapid passagework with almost nothing of melodic interest, the slow movements meander with hints of pleasant tunes, but there is no sense of going anywhere. The Rangström, subtitled ‘A nocturne in the manner of ETA Hoffmann’, for no obvious reason, has some moments of distinct beauty, punctuated by uninteresting and often harsh scratching away, completely ruining the effect. The recording is miked too close so that we regularly hear loud sniffs from one of the four performers. Other than this, I don’t believe that the problem is with the Stenhammar Quartet.